Canada eliminates USA to qualify for Pan Am Championships! 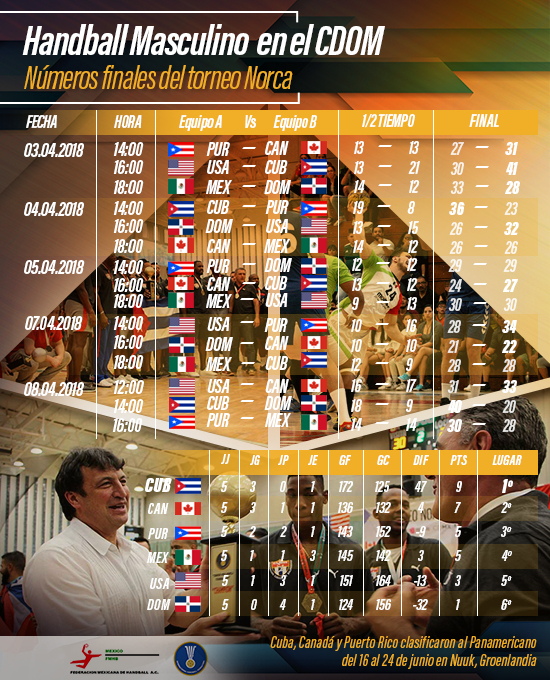 The Canadian mens national team gave one of their best performances in years with a 2nd place finish at the North American and Caribbean Championships (NORCA) in Mexico City this past week and have directly qualified to the Pan American Championships in June. The Reds opened up the tournament on the right foot with a 31-27 victory over Puerto Rico before drawing 26-26 with hosts Mexico the day after in a match that the Canadians likely should have won. In one of their finest performances in a long time against #1 ranked Cuba, Canada led the Cubans by a goal at half but ultimately fell 27-24 against.the strongest team in the region. An extremely close game against a resilient Dominican Republic side on Saturday showcased plenty of character from Canada and the 22-21 win put them in the driver's seat for Sunday's big match against the United States. Canada would defeat and eliminate their rivals to the south 33-31 in a very hard-fought battle that clinched 2nd place and automatic birth to the Pan Ams which act as the qualifier for the World Championships. The team finished with a record of 3-1-1 for seven points with 136 goals scored and 132 against. The Pan American Handball Championships take place from June 16-24th in Greenland. The tournament will see 12 teams battle for one of three spots at the 2019 World Championships in Germany/Denmark. The other qualified nations are Brazil, Cuba, Argentina, Uruguay, Greenland, Chile, Colombia, Peru, Paraguay, Guatemala, and Puerto Rico.